We've found a way to satisfy your sweet tooth without packing on the unwanted pounds. Juicy Fruit is now launching a new line of sugar free gum called Juicy Fruits Desserts which is now available coast-to-coast in Canada. With flavours such as Strawberry Shortcake, Orange Créme Pop and Apple pie, this gum taste just like your favourite dessert. The people at Juicy Fruit worked hard to perfect the exact taste for each of the array of flavours in a single stick of gum. 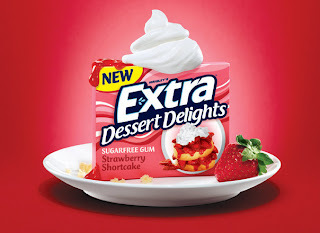 Experience the intense flavour of Strawberry shortcake from the mouth watering crust, sweet fruit filling to whipped cream topping-all in a stick of gum. Now fans of frozen treats, pie or cake and gum can enjoy the very flavourful taste without the added calories. This is a great way to enjoy the irresistible flavour of your favourtie dessert, guilt-free, all year round, and even your dentist won’t notice. We loved the taste that just bursts out of this gum- taste pleasure in every piece!